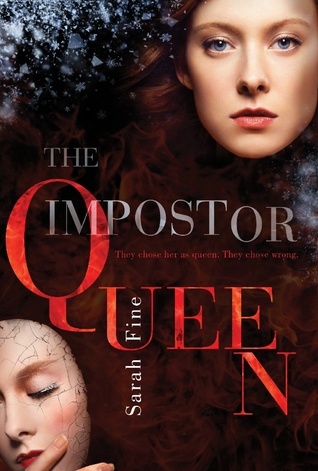 Sarah Fine is my go to author when I want something completely original, entertaining, well written, and imaginative. She has yet to let me down and Impostor Queen was not an exception to her talent nor her ability. Beautifully written, masterfully detailed and laid out, this was hard to put down and even harder to walk away from. Sarah has a away of describing details and her worlds that not only captive but are also so seamless that you hardly know they are happening and before you know it, not only can you picture the world she created but you feel as if you are in the very heart of it, right there with the characters that are every bit as believable as the world in which they live. This was such a fun and exciting read and I'm truly craving more and can't wait to see what will happen next. I predict this will be another outstanding, standout series from Sarah that will be sure to enthrall us all. Definitely, it was so good! I've read great thing about this one, which is why it sits on my every growing wish list. Thanks for sharing! I agree, Fine really is awesome. Great review, Ali! I am so excited you liked this Ali. I plan on listening! Yay! I think you will love it. Great review Kindlemom, I've heard of this author and I think it's time I read her! I am starting this one tonight, and I can't wait. Glad to hear you loved it. You are going to love it too! I enjoyed this one quite a bit. Not as much as you, but it was good. I can't remember what I said in my review now, but I think the beginning was a little boring for me and the second half was really good. It was a bit slow in the beginning for sure but it didn't take too long to pick up. Everyone seems to love Sarah Fine. I need to pick something up by her. Glad you enjoyed this!! Definitely do, her work is so worth it. I really need to read this author. I swear she is on my must read list. Might have to make sure this one is on the list as it sounds perfect for me. I'm happy to hear she is on your list of must reads, she truly is a talented writer. Wheeee! I'll be reading this soon. I haven't finished the Shadowlands series (is that what it's called?) yet, but I couldn't pass this on up. Guards of the Shadowlands I think is what it is called. ;) But they are all fabulous. I think you will like this one too. Yep it hasn't been labeled yet but it is a definitely series. I love when an author uses the perfect words to make us visualize the world with such clarity. Me too, especially in this genre. Definitely try her regardless of which book it is! I had no idea there would be a new series from Sarah Fine. Thanks for putting it on my radar, Ali! I haven't read any of Sarah's books yet, but I have a copy of Of Metal and Wishes, and I am really interested in this one, especially with how much you loved it :) Great review! Of Metal and Wishes is a favorite, you are going to love it and the sequel, they are fantastic! I was curious about this one! I haven't read Sarah Fine before but it sounds like I should! I love that you said this book was fun! I always look for that in my reads! I was afraid it would be depressing, what with her being a failure and all. Is there still magic in the book? There is magic and not depressing at all! Definitely try her and she has an adult PNR/Fantasy as well that is fabulous too!